The Franklin Silver Half Dollar was struck by the United States Mint between 1948-1963 from a composition of 90% silver. Each new coin contained a total of .36169 ounces of the precious metal. These coins followed the extremely popular Walking Liberty Half Dollar which had been minted from 1916-1947. Those were actually due for a change in 1941 after having been produced for twenty-five years, but America at the time was focused on more pressing responsibilities owing mainly to World War II. 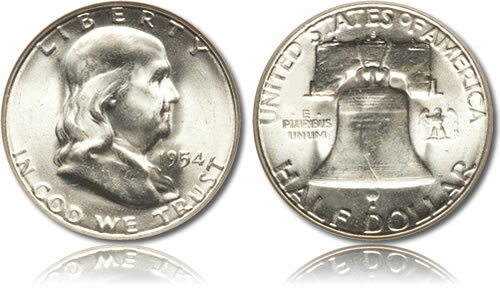 As such, the denomination was not changed to the Franklin Silver Half Dollar until 1948. The design on the Franklin Silver Half Dollar marked a noticeable difference from previous 50-cent pieces. Instead of depicting the mythical figure of Liberty, the coin featured an image of an American founding father, statesman, inventor, diplomat, writer (just to name a few), Benjamin Franklin. The use of an individual was not new for the United States Mint (take the 1909 Lincoln Cent for example), but it did mark a change for half dollars which before had all used versions of the mythical figure of Liberty. Production of the half-dollars was cut short and only ran until 1963. In that year, Congress ordered the coin to feature a design honoring the recently assassinated President John F. Kennedy. Shown on the obverse of the Franklin Silver Half Dollar is a right-facing portrait of Benjamin Franklin as completed by John R. Sinnock. Surrounding Franklin are the inscriptions of LIBERTY, IN GOD WE TRUST and the year of minting. The reverse shows a cracked Liberty Bell along with a small eagle to its right. Also included are the inscriptions of UNITED STATES OF AMERICA, E PLURIBUS UNUM and HALF DOLLAR. If included, a mintmark is seen right above the bell.